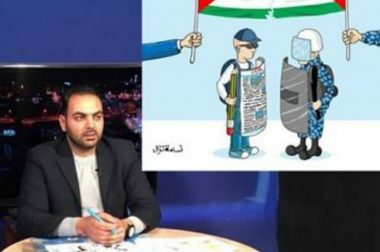 Many Israeli soldiers invaded, on Monday at dawn, the village of Kafr Ni’ma, west of the central West Bank city of Ramallah, before breaking into and searching the home of a Palestinian artist, and confiscated his Caricatures. The artist, Osama Nazzal, said the soldiers surrounded his family’s home, approximately at 4 at dawn, before invading it and ransacking its property. Nazzal added that the soldiers damaged many of his drawings, and confiscated all the remaining caricatures, before withdrawing. It is worth mentioning that the army abducted, at dawn Monday, fourteen Palestinians, including a recently-released political prisoner, in different parts of the occupied West Bank, five of them, including two children, from Bethlehem.